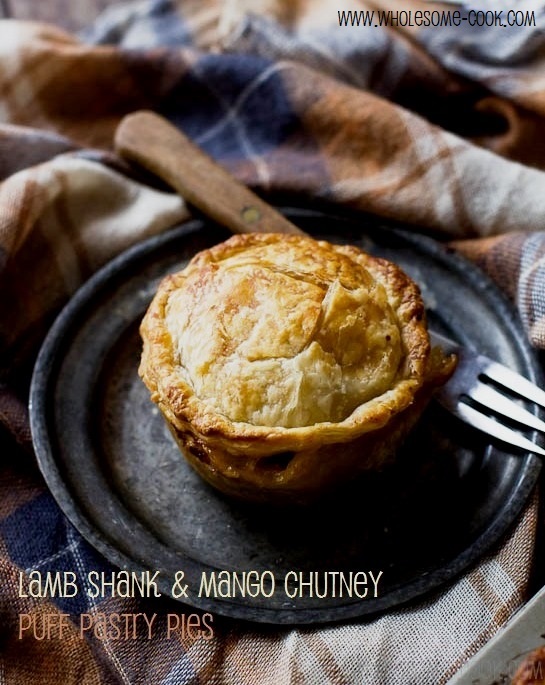 Personally, I find the combination of flaky pastry pies filled with slow-cooked lamb shanks and the aroma of exotic spices in the mango chutney, simply irresistible. 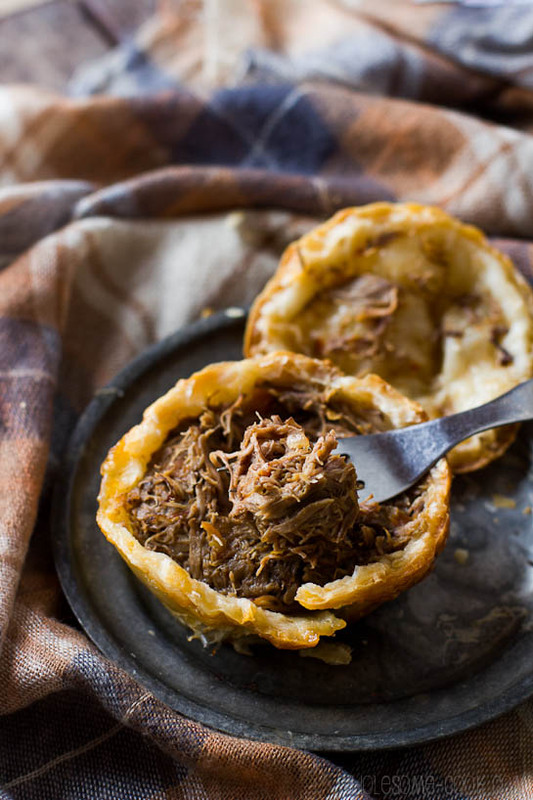 The recipe is fantastic for using up any type of leftover slow-cooked or pulled meat and the pies freeze well, so not much can go to waste. 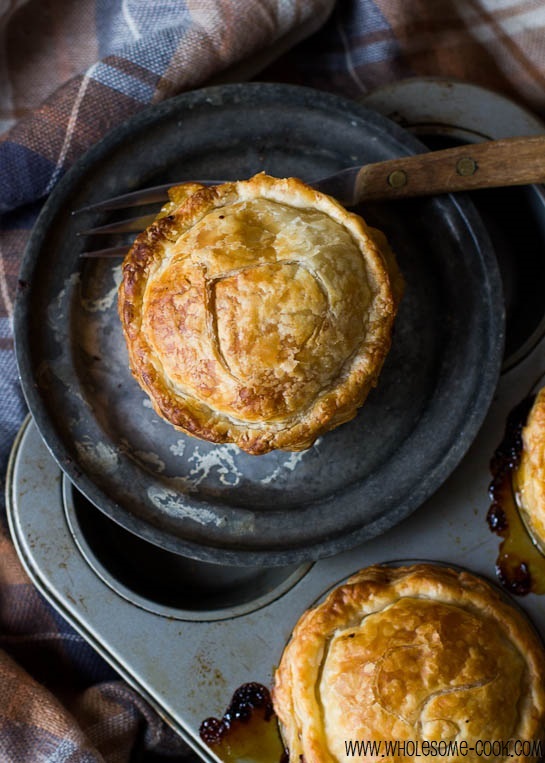 Unless you come from an Australian background or British or Irish heritage, the concept of a meat pie may be a little foreign to you. In fact, my Mum would often giggle when being told someone was having a “meat cake” – a translation she came up with to justify the giggle-worthiness of the now Aussie classic. For me, it’s a pie as good as any. And this one is no exception. The appeal of its classic, light and flaky puff pastry “lid” goes beyond just the “lid”. Because if you want out-of-this-world pies, use puff pastry for both the case and the lid. Have you ever tried it? You so should next time… There’s a pie shop in the city that sells all-round puff pastry pies and they are amazing. The pastry crisps up while remaining inherently light, unlike those stodgy, rubbery and floury shortcrust pie “bowls” used in so many pies. Prompted by the cooling weather and the last of the season’s mangoes I whipped up the Mango Chutney adapting from this recipe a couple of weeks back. 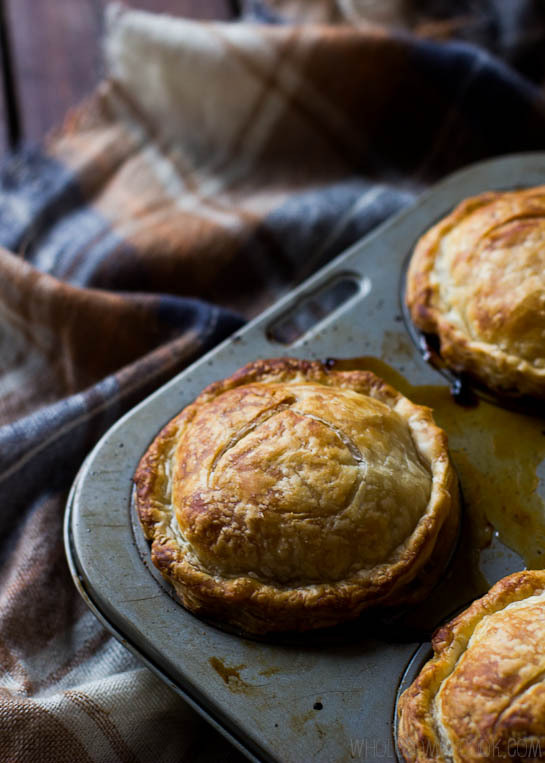 With the weather turning colder and rainy later that week, these Lamb Shank and Mango Chutney Pies with a warm hint of curry, were a welcoming comfort. Perfect for anyone who is not a big fan of meat off the bone. The last two are tucked away in the freezer, waiting to be devoured one day soon when the weather turns for the worse and we’ll be in need of a quick, but nourishing meal. The recipe works well with any leftover slow-cooked meat but lamb and the mango chutney adapted from Lorraine's recipe go together especially well. Makes 6 pies. Or about 9 if you don't have a pie tin and you make the pies in a muffin tin - you may need to re-roll the scraps to make the last pie. You will need to adjust the amount of puff pastry sheets. Dairy-free, egg-free, use gluten-free puff pastry for a GF version. Wash lamb shanks under cold running water. Pat dry with paper towels. Mix together the spices: paprika, cumin, pepper, salt, onion powder and garlic powder. Rub spice mix into the shanks. Heat oil in a heavy-based casserole or a stock pot large enough to hold the shanks lying flat. Add enough cold water to cover the shanks. Add bay leaves, cloves and 2 cups red wine. Cover and bring to a boil. Reduce heat to a gentle simmer and cook covered for 3 hours, or until the shanks are tender and the meat is falling off the bone. (In the meantime, prepare the chutney). When the meat is ready, turn off the heat and allow the meat and brine to cool for a few hours, or overnight.before picking the meat off. Discard the bones, gristle and stock. Place all ingredients in a medium-sized pan over medium heat. Bring to a boil then reduce to a slow simmer and cook, covered, for 30 minutes. Stir often and add a little water if the chutney becomes too thick, When ready, remove from heat and allow to cool before using. Preheat oven to 220C (200C fan-forced, 425F, gas mark 7). 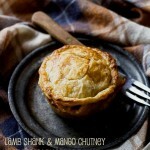 In a large bowl, mix together the lamb shank meat and mango chutney. Grease your pie tins inside and around the rim with oil. Place 3 pastry squares into the pie tin holes and press gently into the cavity. Spoon enough lamb shank mixture into the pastry to come up to the edge of the tin. Cover with another pastry square and press firmly around the edges to seal. Trim pastry edges with a sharp knife. Repeat the process with the remaining pies. Bake for 15-20 minutes or until the pies have turned golden brown and crisp. The lids may come loose during baking, but don't worry, they will add to the pies' rustic charm. OMG! Yum… Perfect for this sort of weather, you are right. This soudns amazing, I’m a big pie lover and glad to see you can use leftovers in this and freeze the pies too! Thanks for sharing. Looks fabulous! I love your choice of spices for the chutney. I’ve never made chutney before… I guess it’s about time! Indeed! It’s fantastic to add flavour to stews, soups, spaghetti, pasta bakes, risotto, served with fish or meat and in PIES! 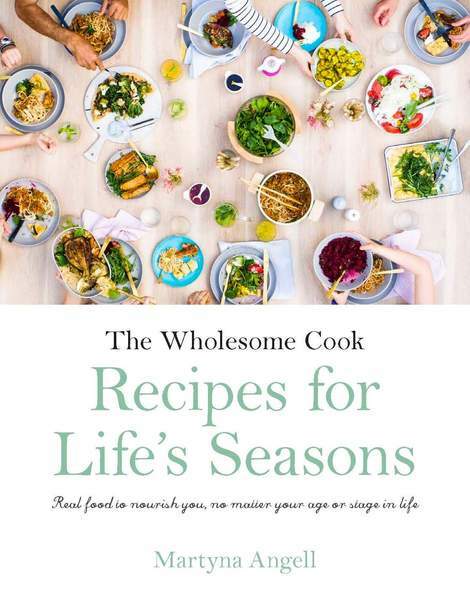 Plus this one has the added benefit of healthy apple cider vinegar and coconut sugar (rather than processed sugar). How could anybody not like a good pie? I sure love these! I made a lot of Mango Chutney this summer and I can imagine my carnivorous family eating all of these within minutes. Thank you again Martyna for another amazing recipe. What sort of pie pan is that Martyna? I want one. 🙂 Those pies look amazing. My husband would give me anything if I served a pie like that, I’m sure of it. Thank you BAM! You too! Hi, Your blog is defiantly my new fav at the moment! I am wanting to make these pies but I am not too sure what you mean by place 3 pastry squares into the pie tin, when you say you only need 2 sheets cut into 4 pieces but it makes 6-9 pies? Thank you!! Also do you think I could use bought curried mango chutney? Thankyou!